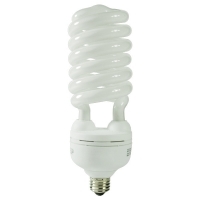 The 40 watt T4 spiral CFL from Overdrive has a standard, E26 screw in base for easy replacement. The bulb produces 2600 lumens of light, at 5000K, allowing it to be a suitable replacement for a 150 watt incandescent natural daylight white lamp. It cannot be used with dimmers, and should be recycled once the bulb has reached the end of its life.